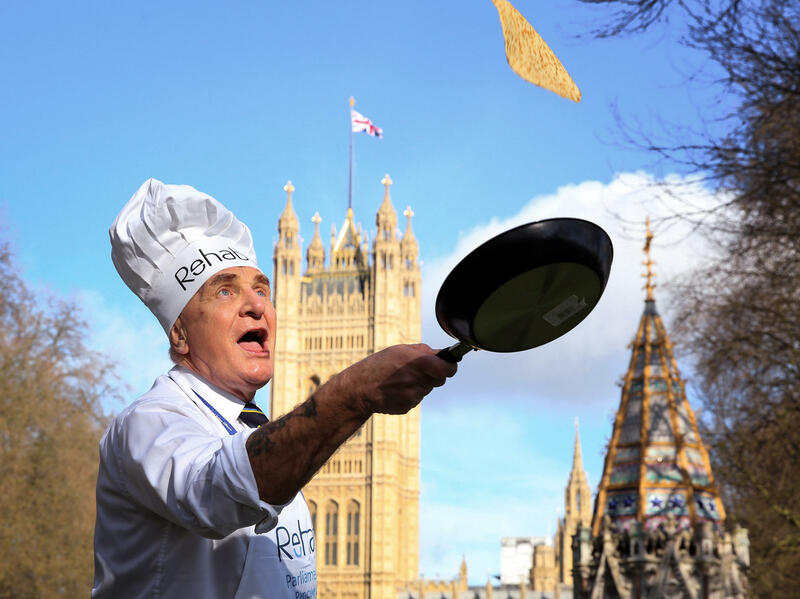 Steve Pound, MP, pictured at the Rehab Parliamentary Pancake Race 2017. Pancake races are a Shrove Tuesday tradition in England dating back centuries. 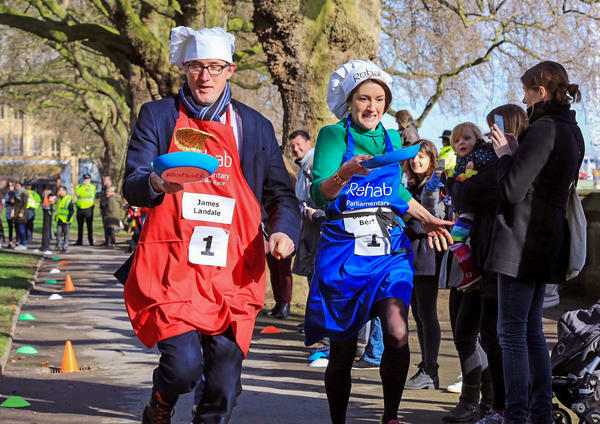 James Landale of BBC News and Baroness Bertin of the House of Lords pictured at the Rehab Parliamentary Pancake Race 2017, in which the members of Parliament's team secured victory for the second year in a row. Today is Pancake Day in the United Kingdom, or Shrove Tuesday, as it's known on the Christian calendar. It's a time for indulging before the beginning of Lent and, in Britain, racing around with a frying pan, flipping pancakes. Every year, people gather in backyards and on streets for pancake races, which have a history dating back centuries. This morning, members of Parliament and the House of Lords took on national media in a relay race around a garden along the Thames, just down the street from Big Ben. Wearing white chef's hats and aprons, they flipped pancakes and handed off frying pans in a 10-lap race to raise money for Rehab Group, a health charity that helps people with brain injuries. That worthy cause, though, did nothing to restrain the race's traditional shoving and cheating, which is part of the fun. Racers stuffed extra pancakes in their pockets, in case they dropped the ones in their frying pans, as they often did. Speaking before today's race, Liz McInnes, a member of parliament from northern England, recalled some members of the Upper House hitting the deck in the 2016 contest. "There were Lords on the floor last year. I was running over Lords who'd fallen over," she said. "I stopped to pick my pancake up last year, which was a mistake — never pick it up if you drop it." Carrying an extra pancake in your pocket is "part of our tactics," McInnes said. "Any rules are made to be broken, I think." The origins of Britain's pancake race are decidedly more civilized. The story goes that a woman lost track of time while cooking pancakes on Shrove Tuesday back in 1445. When she heard the church bells ring, she rushed out the door and raced to church while still holding her frying pan. Some of today's participants grew up with the pancaking racing tradition, including Tim Loughton, a member of parliament with the Tory party who represents part of England's south coast and is the son of a minister. "We used to do it in school," said Loughton, before the race. "My father was a vicar, so Pancake Day and Easter and the build-up towards that was always a big thing for us. So, yes, pancakes are in my blood." British racing pancakes bear no resemblance to the fluffy ones Americans might eat at an IHOP. The U.K. version is flat – more like a crepe — and tends to split apart by the third flip. The ones distributed for today's race came in a packet and were store-bought. "There's a big debate now over what you should have in a pancake," said Clive Lewis, a parliamentarian with the Labour Party. "You can have Nutella on it, or butterscotch. Back in the day, the tradition is just lemon and sugar," which is Lewis' favorite. After 10 laps, a member of parliament running the anchor leg crossed the line in a near-photo finish to cheers from the 200 or so people watching. The members of parliament team took first place — by the length of a frying pan. It's Shrove Tuesday on the Christian calendar, the last day to indulge before the beginning of Lent. So in New Orleans, people are celebrating Mardi Gras. In Brazil and elsewhere, it's Carnival. The British do things differently. In the United Kingdom, people are racing around with frying pans, flipping pancakes. NPR's Frank Langfitt reports from London on the ancient and colorful traditions of Pancake Day. UNIDENTIFIED WOMAN: Three, two, one - go. FRANK LANGFITT, BYLINE: And they're off. UNIDENTIFIED WOMAN: (Unintelligible). Oh, that James Landau - he's got some speed on him, hasn't he? LANGFITT: Oh, my gosh, somebody's already dropped a pancake. Teams from Parliament and the House of Lords took on national media this morning in a relay race around a garden along the Thames. They flipped pancakes as they ran, all to raise money for rehab, a health charity that helps people with brain injuries. That worthy cause, though, did not hinder the race's traditional shoving and cheating. Member of Parliament Liz McInnes said the Upper House took the brunt of it last time around. LIZ MCINNES: There were lords on the floor last year. I was running over lords who'd fallen over. MCINNES: Yeah, yeah. I stopped to pick my pancake up last year, which was a mistake. Never pick it up if you drop it. LANGFITT: Is it cheating to carry an extra pancake? MCINNES: No, no, that's part of our tactics. LANGFITT: Are there no rules? MCINNES: Any rules are made to be broken I think. LANGFITT: The race has more civilized routes. Story goes that a woman lost track of time while cooking pancakes on Shrove Tuesday back in 1445. When she heard the church bells ring, she rushed out the door still holding her frying pan. Some of today's racers grew up with this tradition, including Tim Loughton, an MP with the Tory Party and the son of a minister. TIM LOUGHTON: We used to do it at school. My father was a vicar, so Pancake Day and so Easter and the build up to it - to that was always a big thing for us. So yeah, pancakes are in my blood. LANGFITT: British racing pancakes bear no resemblance to the fluffy ones Americans eat. The U.K. version is flat and tends to split apart by the third flip. CLIVE LEWIS: And there's a big debate now over what you should have in the pancakes. LANGFITT: Clive Lewis is a parliamentarian with the Labour Party. LEWIS: You can have, like, Nutella on it or butterscotch. Back in the day, the tradition is just lemon and sugar. I'm going to go. Look; I've got to go (unintelligible). LEWIS: Lemon and sugar. I'm a traditionalist (laughter). And there it is. The MPs won. The MPs have won. The members of Parliament finished first by a frying pan length. Frank Langfitt, NPR News, London. MAID MARIAN AND HER MERRY MEN: (Singing) It's Pancake Day. Yes, it's Pancake Day. Yes, it's Pancake Day. Transcript provided by NPR, Copyright NPR.